Although DIGICo says that the event of a D5 digital audio engine developing a problem is very unlikely, the company still launches the D5 RE (Redundant Engine), a standalone outboard engine system that provides total audio engine redundancy through a few simple connections to any DiGiCo D5 Live console. 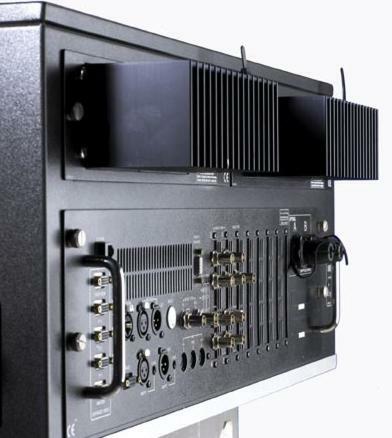 The RE is daisy-chained to the main console and stage racks via standard D5 optical fibre cables and additionally connected from MADI port 2 on the RE to the auxiliary MADI port on the D5 local rack with two 5 metre BNC MADI cables (supplied). A crossed Ethernet networking cable is then connected between the CAT5 ports on console engine and RE, so sessions can be synced to enable the RE to mirror the D5 console. This means that, in the event of the master audio engine developing a problem, audio is automatically and transparently switched to the RE without any interruption in programme material. Audio processing can be switched back to the main console work surface at any time with the press of a single screen button. The D5 RE is flight cased, contains a complete D5 engine assembly, two PSUs and trackball keyboard for set-up procedure. An external monitor is required for console visuals.